Because of the change in evaluation, some courses may receive a different number of CEUs than in years past. We believe enforcing this new evaluation standard will create a more consistent approval process that can be applied impartially to every application. USA Triathlon reserves the right to assign or deny a CEU value to seminars and conferences. CEU values are based upon relevancy to triathlon coaching and are assigned by USA Triathlon, not by what another organization assigns. CEUs will not be awarded to courses that are deemed to be in direct competition with existing USAT programs. Examples include webinars, symposiums, mentorship programs, and triathlon coaching certification programs among others. 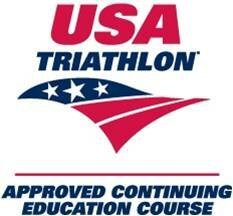 USAT CEU approval is valid for one calendar year. For instance, regardless of when you submit a USAT CEU Application in 2017, once your course is approved, it is approved until 12/31/17. If you would like your course approved for the following calendar year, you must go through the USAT CEU Application process again. By submitting a USAT CEU Application, you are agreeing to waive all fees for up to three USA Triathlon staff members to attend any clinic. If a USA Triathlon staff member decides to attend your clinic, you will be notified by the staff member in advance. By completing this application, you agree to only promote CEU amounts as determined by USA Triathlon staff. Failure to use the provided certificate of completion or promoting incorrect CEU amounts will result in the course no longer being approved in future years.